With the Cubs back for another season, I thought it would be a good time to review my favorite hot dogs. While I haven’t written about everywhere on this list individually, I’ve been eating hot dogs for as long as my dad could sneak me food behind my mom’s back, and I definitely remember my favorites. It’s also worth mentioning that there are a ton of hot dogs in this city and only so many arteries to go around. With that in mind, these are my ten favorites. You might have a favorite neighborhood spot from childhood, and this one is mine. Ask for Drew and you’ll get the V.I.P. treatment (that everyone else in Buffalo Grove gets for knowing Drew). If you come in after a little league game, you’re bound to score some free stuff. The French fries are hand-cut and the dogs charred. If you don’t want the hot dog, the chicken sandwiches are spot-on, too. Before watching the Northwestern football team play in a high school stadium, gorge yourself on one of these bad boys (but only if you don’t want Buff Joe’s wings). 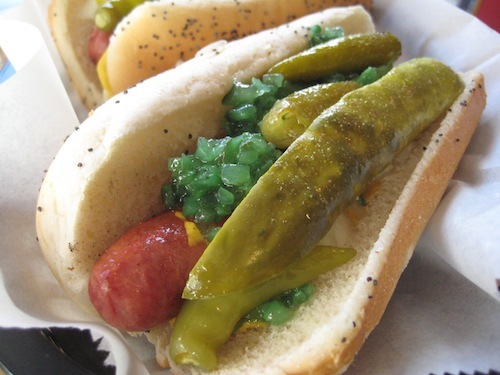 Go for the Chicago style with everything. The line of suburban families builds up before games, so try not to make too much of a mess if you have to eat while standing… shelf space is limited. A stronger Polish sausage than dog, I’m going to count all encased meats in this list. They like ’em salty at Jim’s. Don’t be fooled by the impersonator down the block, Jim’s Original is the location you want. Make sure to get plenty of mustard and onions for toppings. Also, don’t worry if the fries come smushed on top of your Polish. People might knock it as a chain throughout Chicago, but you can’t deny the quality. 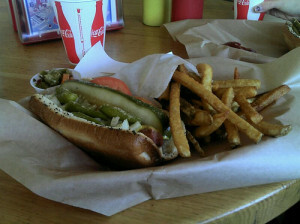 Portillo’s is rocking some of the best shakes, salads, and crinkle-cut fries too. The bun sticks to the snap filled dog in just the right way. The memorabilia all over the walls gives a nice feel, and you’re guaranteed pretty quick service. If you’re sensitive to racial slurs, this probably isn’t the right place for you. Get the cheese fries and a char dog. Go late at night, but don’t give the wrong look to any of the frat boys crowding the place or you might end up in a sloppy fight. If you think you got shorted on the cheese, take a peek in the corners of the folded bag you got them in (there’s probably some hidden treasure). If you haven’t tried frips (French fried chips), you need to check this one out. 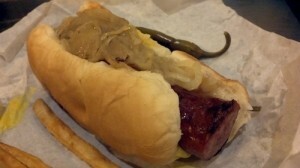 There is a solid variety of sausages without the wait that might accompany a popular spot like Hot Doug’s or Franks N’ Dawgs. 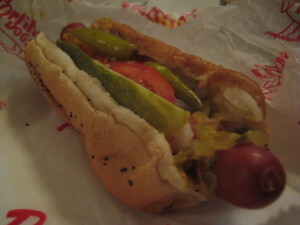 Still, the classic Chicago dog is hard to beat here. In an area left empty by the Children’s Hospital move, this hot dog spot stands strong. Though a slightly less popular purveyor of creative encased meats than Hot Doug’s, Franks ‘N’ Dawgs has got plenty to bring to the table with a solid Brunch Dog and common menu changes. Plus, you never have to wait an hour. 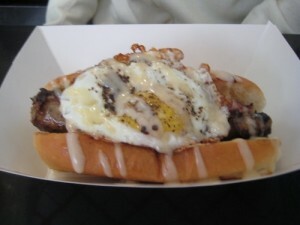 The truffle fries carry some weight, and I like the duck confit on top of my dog, too. No need to skip on the decadence. Tip: go with the Meatloaf table identifier. Just try and get Phil to stand up! This place makes every last attempt to kill you. The food is so good and just awful for you at the same time. Hot dogs and burgers are well executed, and if you want some variety you can go for the salami mac n’ cheese. Fries are thin cut, but I think you’ll eat enough to make up for any size differences. Despite the aforementioned cracks about the wait time, it might just be worth everything. The nacho cheese fries are nothing special, but each sausage is well thought out and perfectly prepared. It’s quickly becoming one of those places on a short list of must-visits in Chicago. 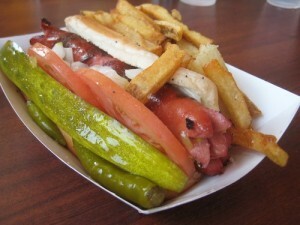 I’d go for whatever the daily special is rather than the standard Chicago dog. If you are looking to try some rarer meats, this is your spot. Drive-in style is the way to go. I’ve been eating these dogs my whole life. A solid casing, sweet relish, sport peppers, and a soft bun make this the perfect dog. It might cost a little more, but I like to think I’m paying for the nostalgia. 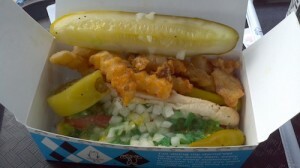 For those of you looking to work for a brain freeze, Superdawg has some of the thickest shakes in town. too. 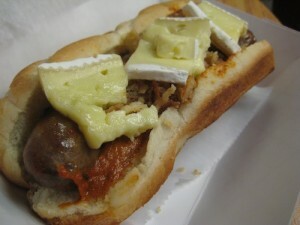 The whoopskie dog (their version of the Polish) ain’t bad either. Jeff Pearl has lived in the Chicagoland area his whole life, and is currently a medical student at Northwestern University’s Feinberg School of Medicine. Food has always been one of his passions. In his free time, Jeff enjoys cooking with his friends, going out to a new restaurant, or training for his next triathlon. 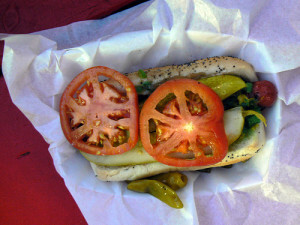 In February 2010 he started writing about his dining experiences in his blog, Jeff Eats Chicago.